Our Annual General meeting will take place on the 12th of October from 6pm. After the meeting, we will hold a public talk with two human rights defenders from Mexico, Marcos Arturo Leyva Madrid, founder of Educa, and Rosalinda Diocinio, leader of COPUVO. This public talk is organised jointly with PBI Ireland. egral human rights framework in order to contribute to profound democratic transition. EDUCA also works in communications and documents the work of movements and organisations fighting mega-projects in the Coast, Central Valley and Sierra Sur. For example, EDUCA accompanies the resistance against the expansion of the “San José” mining project in the Ocotlán Valley and in Ejutla, as well as the hydroelectric dam “Paso de la Reina” in the Coastal area of Oaxaca. enders and anything which threaten human rights in Oaxaca. Rosalinda Dionicio is one of COPUVO’s leaders and comes from the zapoteca community of San José del Progreso. She survived an attempt on her life in March 2012, in which her partner Bernardo Vásquez Sánchez was assassinated. As a result of this event, she almost lost one of her legs and to date she still suffers physical and psychological trauma. In reaction to the attempted assassination in 2012 she took up legal studies in the university to become a lawyer. She is protected by precautionary measures to ensure her safety, and she continues the struggle to defend the rights of her community and the rights of mother earth. 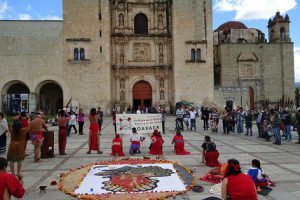 The Coordination of the United People of Ocotlán COPUVO was founded in 2009 to demand the closure of the “San José” mine owned by the Cuzcatlán Mining company, a subsidiary of Canadian owned Fortuna Silver Mines. The exploration phase which had begun in 2006 violated several international Human Rights treaties, among them the ILO’s Convention 169 which stipulates free and informed prior consultation before carrying out projects on indigenous lands. The mining project has affected the municipal areas of San José del Progreso, Magdalena Ocotlán and Ejutla de Crespo, causing devastation to mountain slopes as well as water shortages, contamination of the aquafers and the air caused by open course drainage of acids. The mining operation has resulted in the breakdown of the social ties in the area due to the purchase of individual lands through bilateral agreements and a lack of respect for the political and social structures of the community and their intrinsic rights as indigenous people. Neither the mining company nor the local authorities have acted with transparency , providing no access to information of the current phase of the project or the plans for future expansion. COPUVO participates in the resistance movement against this mining project , joining with agrarian, municipal and community organisations in the Ocotlán Valley and Ejutla. EDUCA accompanies them in this process.